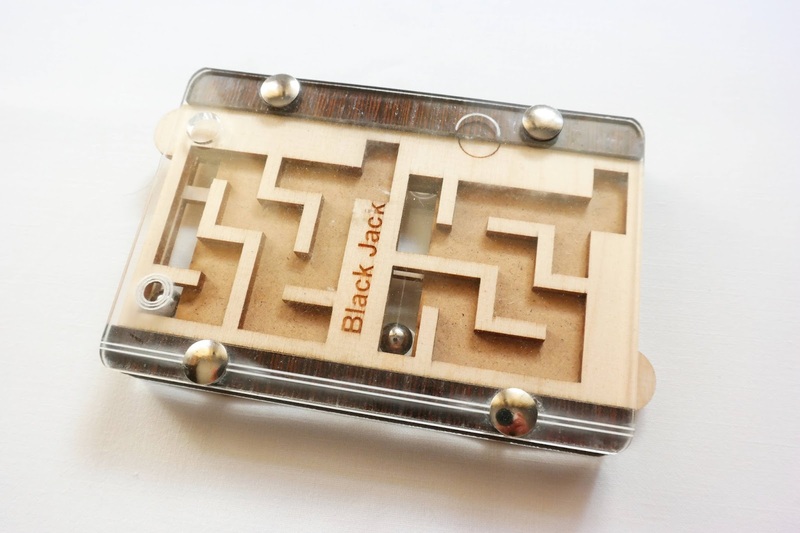 Black Jack is yet another interesting design by Jean Claude Constantin that uses multiple mazes to really challenge our minds. Are you ready to conquer another difficult labyrinth by Constantin or are you going to get lost in the winding path? The Black Jack - curiously one of the very few Constantin puzzles that don't have a German word for its name - is actually a four maze puzzle disguised as a double maze. 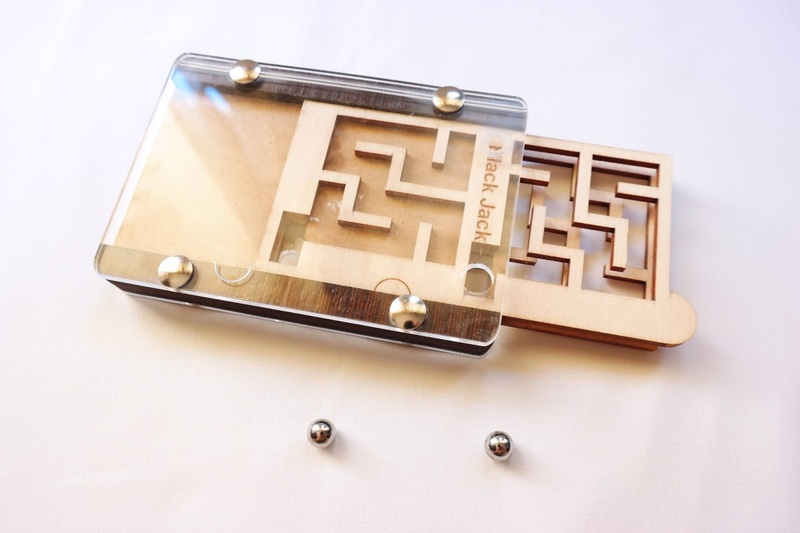 It consists of two wooden platforms that slide back and forth, each one having two different mazes, one for each metal sphere to navigate around. Between the two platforms is another wooden sheet with a vertical path that lets the spheres go up or down. The only way to move the spheres is by sliding the platforms so there's always a path for them to move up or down. You solve the puzzle when you finally manage to guide the spheres all the way up the vertical path and remove them through the exit hole. This is quite a challenging puzzle because of the four mazes. For each sphere you have to maneuver two mazes simultaneously by flipping the puzzle and check your next move. When you pull on a platform both spheres need to have a clear path ahead or behind them, otherwise your move will be blocked. The puzzle is classified as a level 9/10, and I mostly agree with it. Its mazes aren't all that difficult individually, but by combining them into two sets of two mazes it becomes a highly difficult challenge, one that will sure put your attention skills and patience to the test. I was able to solve this one within 20 minutes, after many failed attempts. There's no easy way to reset the puzzle to its starting position, so you'll have to do it all again backwards if you want to put it back again. The Black Jack by Constantin is an ambitious design with a rather complex concept. It's amazing how the designer could come up with this incredible puzzle. If you are a fan of mazes, I highly recommend this one. 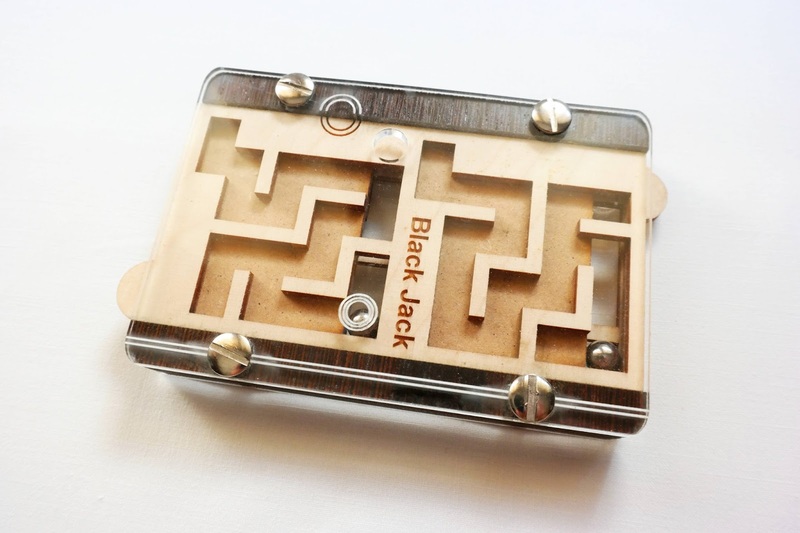 Availability: The Black Jack puzzle is available at Brilliant Puzzles for $24.95 USD. You can also find many other great designs by Jean Claude Constantin.